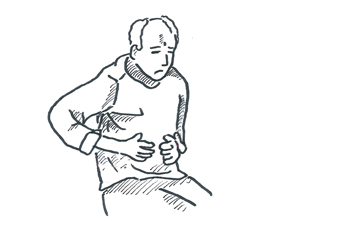 Overview Chronic pancreatitis is characterised by recurrent or persistent abdominal pain arising from the pancreas. The inflammatory process results in irreversible destruction and fibrosis of the pancreas. Often associated with exocrine or endocrine pancreatic insufficiency. 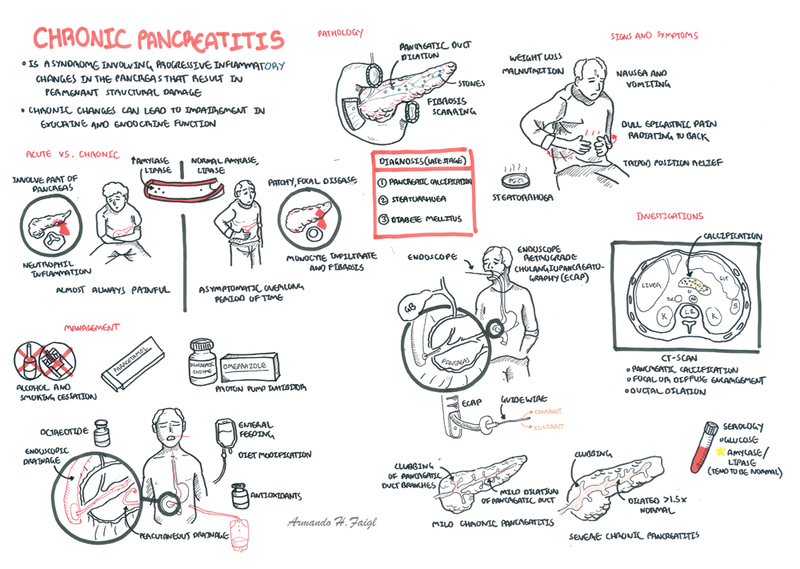 Clinical Presentation of chronic pancreatitis is similar to acute pancreatitis but less severe. 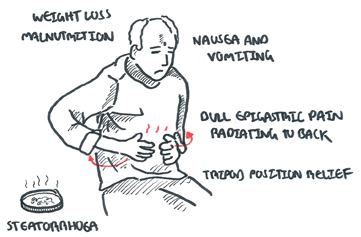 This include epigastric pain that may radiate to the back, nausea and vomiting. Patients may present to ED and require opiates. Pain is worse with food and alcohol. 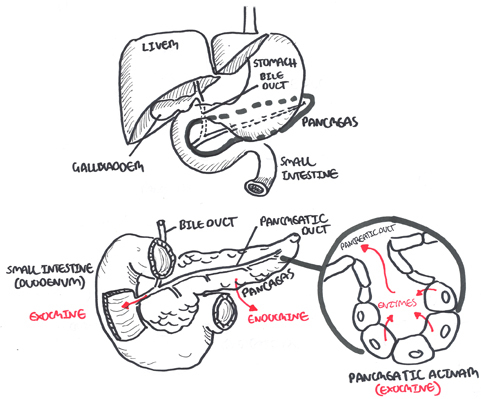 Exocrine features of chronic pancreatitis include weight loss and malnutrition (due to malabsorption of macromolecules) and also steatorrhea (due to fat malabsorption). Abdominal ultrasound – may show cystic changes and duct dilatation within the pancreas. 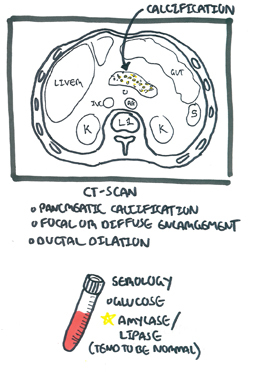 CT scan of the pancreas may identify the cause and may show extent of the disease. It can show pancreatic cyst, calcifications, tumours. ECRP demonstrates irregularities of the pancreatic duct strictures, calculi, dilated segments (chain of lakes), and changes in first and second order branches and cyst formation. 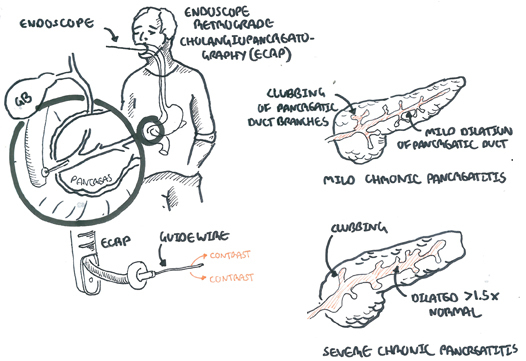 ECRP helps in showing extent of disease and useful for staging. Chronic inflammatory changes include atropy, duct dilation, microcalcification and intraductal stone formation with cystic changes secondary to ductal occlusion. Management involve prevention of cause/progressive damage by stoping alcohol and smoking. Encourage diet rich in antioxidant. 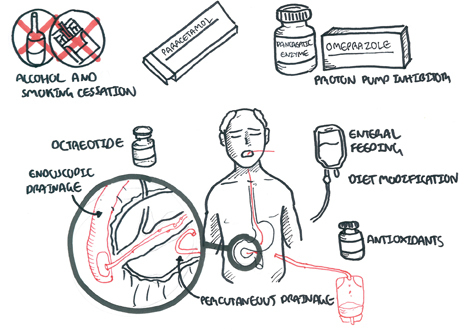 Controlling symptoms and complication involve dietary modification (low fat), pancreatic enzyme supplements, analgesia (may require opiates), insulin (for diabetes if develops). Surgical management includes percutaneous or endoscopic drainage to drain excess fluid in the pancreas that is causing obstruction. Pancreaticduodenectomy is performed to remove possible causes and complications. Ten-year survival after diagnosis is 20% to 30% lower than the general population.